Four: The Lodge Enameled Cast Iron Covered 3.6 Qt. Casserole is sure to become her favorite—and a treasure she will want to pass along to the next generation (that could be you). A fraction of the cost of a Le Creuset version of the same thing, it is just as gorgeous and the perfect size for everyday use. It’s like the best of both worlds—a skillet and a Dutch oven pot. About $55. Five: I use my Herb Scissors Stainless Steel Scissors all the time, now that I figured out why that blade cover has all those notches in it: To clean out the scissors when finely cut pieces of herbs get stuck between the blades. Duh! It works great, too. About $15. Six: It’s a batter bowl! This Le Creuset Stoneware 2-Qt. Batter Bowl is the perfect size to mix a cake, make pancake and waffle batter; muffins, cookies—any and all! Available in a variety of colors, this is a lovely piece of kitchen equipment that any true foodie is bound to adore! About $40. Seven: Oh, be still my heart! That’s what your Mom will say when she opens this beautiful 100% Cotton Hypoallergenic Striped Cable Knitted Throw Blanket trimmed with adorable pom poms. It’s lightweight and just the right size at 59 x 79 inches (smaller options available, plus your choice of three colors: soft pink, pale gray or creamy white). About $45. 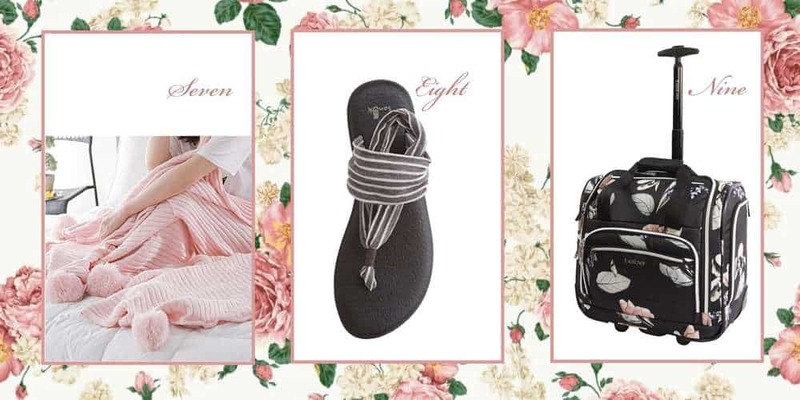 Eight: These Yoga Sling Flip Flop Sandals are so cute they may be past the legal limit! Just kidding, but they are that cute. The soles are actually made from yoga mats, which makes them so comfortable—like walking on a cloud. And the fabric uppers are made from very soft fabric that’s not too tight or too loose … just right! About $32. Nine: Get your Mom airplane ready with this BEBE Women’s Valentina-Wheeled Under the Seat Carry-on Bag in black floral. It’s the perfect size with the perfect inside configuration. That means it is well-designed to hold a lot and keep all of it organized. This is an amazing bag at an equally amazing price: About $55. Ten: Alert—if your Mom does not have a great sense of humor (your siblings, too), skip ahead to the next item. But if you love to laugh with your family, this Favorite Child Mug will encourage that on Mother’s Day. Just make sure she opens your gift first! Not only is this the cutest ever, the mug itself is the perfect size for her morning cup of coffee. That means you’ll be remembered every day, too. About $10. 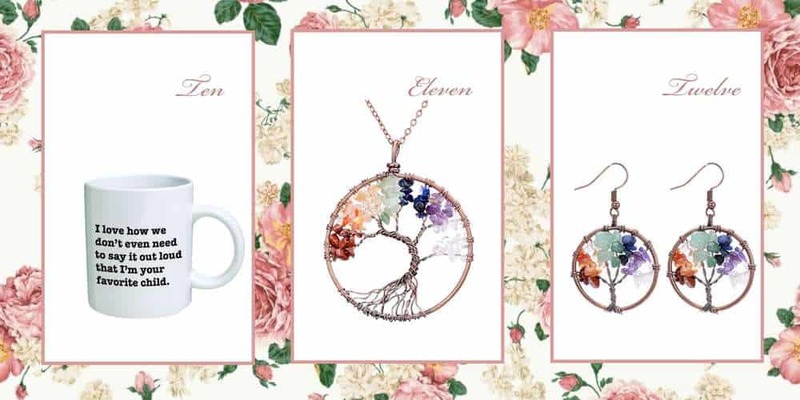 Eleven: The Tree of Life Pendant with Gemstones is so pretty. Comes in a variety of colors with an 18-inch chain. I’d ignore all of the dubious promises that wearing this will make you healthy, wealthy and wise. Wear it and enjoy the simple beauty of this jewelry piece. About $16. Twelve: The Tree of Life Earrings with Gemstones make a complete ensemble and a lovely statement. About $16. Thirteen: The Mother Daughter Forever Tree of Life Bracelet is constructed of high-quality stainless steel and comes complete with a hand-stamped disc and stainless steel tree charm. 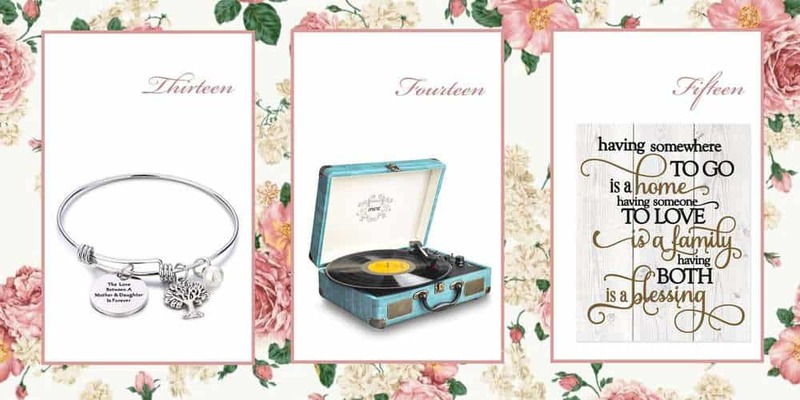 Perfect gift for mother to daughter, or daughter to mother … and adaptable for most all ages as well. About $15. Fourteen: Want to see your Mom smile and feel the need to start dancing? Give her this Miric Record Turntable with Speakers, Headphones and Bluetooth to play her old vinyl records. Looks as amazing as it operates in that pretty blue color. Want more? How about a 24-month warranty? Yep. Got that, too. About $80. Fifteen: This beautiful wall sign just about says it all: Having somewhere to go is a home; having someone to love is a family. Having both is a blessing! Permanently printed on wood, this sign is about 12 x 15 inches. Includes hardware for hanging. About $25. Sixteen: Finally, Joanna Gaines’ cookbook is available and waiting for your Mom to dive into it. Magnolia Table: A Collection of Recipes for Gathering is filled with Joanna’s warmth and passion for all things family. And she shares her family’s favorite recipes, too. Could there be a better gift? About $18. 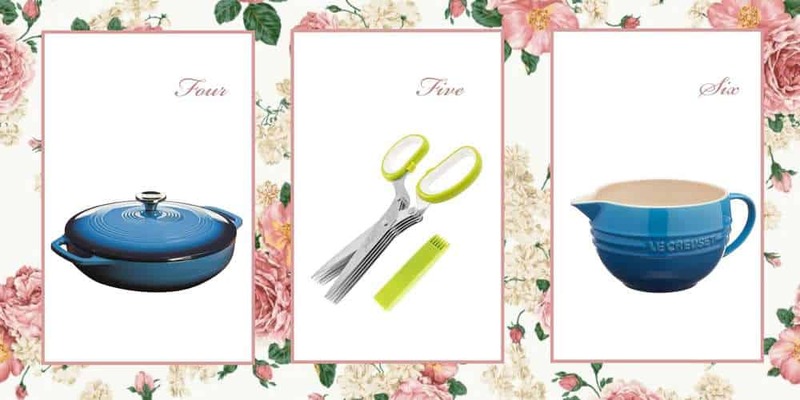 Seventeen: Mom is going to need a good supply of fresh herbs to put those Herb Scissors (above) to work! And what better way to do that than to grow them herself. Aerogarden Harvest sits on a table or counter indoors. 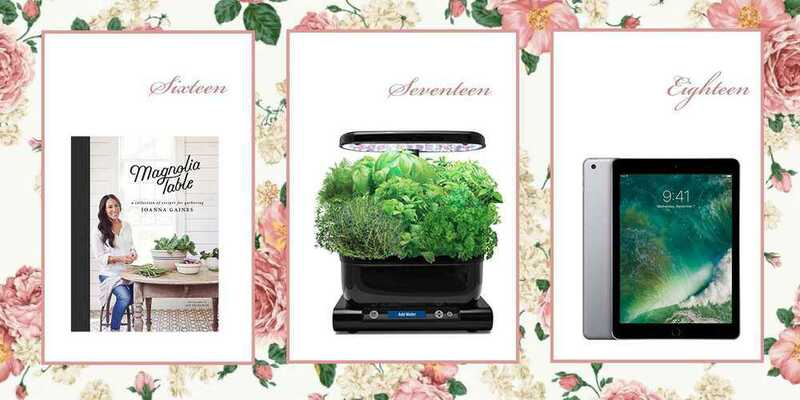 It comes complete with a grow light and herb seed pod kit—everything she will need to get her indoor garden growing. Just imagine: No weeding, no bugs or other pests. And it looks awesome, too! About $111. Eighteen: Apple iPad 9.7″ (2017) 128GB Wi-Fi – Space Grey. 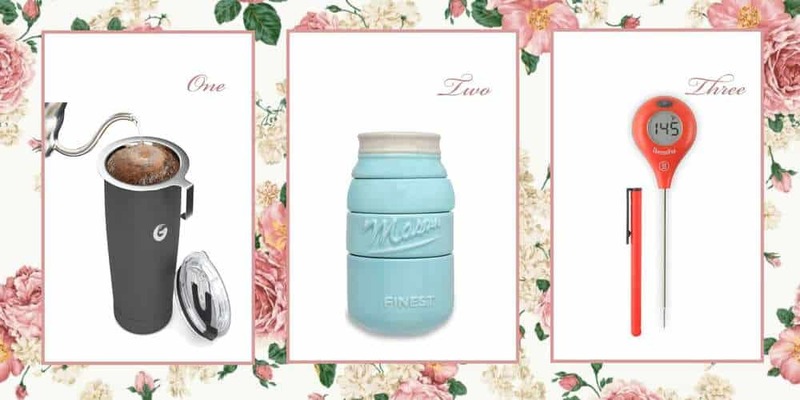 I’m sure that this price of less than $400 is not going to last long, but while it does there are going to be some very happy mothers out there come Mother’s Day. I have this iPad and I love, love, love it! About $380. Nineteen: These Women’s Polarized Sunglasses from EYE LOVE are super stylish, well made and guaranteed to include 100% UV Block. So comfortable, Mom will want to wear them all the time, so please be gentle when you point out the fact that she’s been in the house for two hours now and it might be time to take off the shades. About $30. 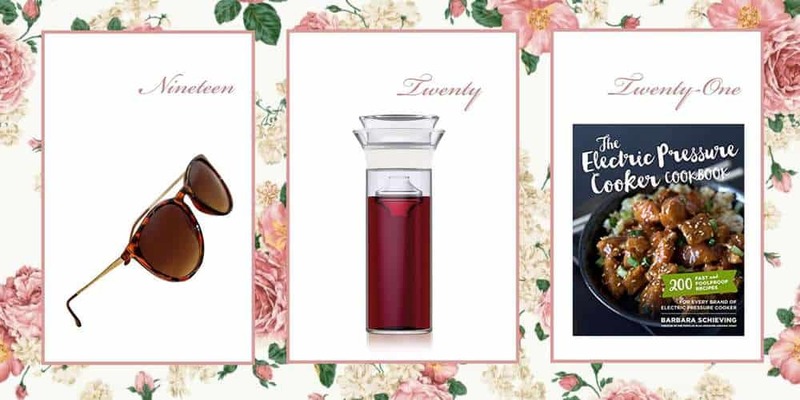 Twenty-One: Whether your mom has an Instant Pot or another type of electric pressure cooker, this is the instructional cookbook she needs. It is clearly written with directions for all type of cookers. The Electric Pressure Cooker Cookbook: 200 Fast and Foolproof Recipes for Every Brand of Pressure Cooker—it’s amazing and I’m not the only one who thinks so. Check out those reviews. About $17. Twenty-Two: This beautiful Willow Tree Angel of the Garden will bring much joy to anyone who finds solace and joy working in a garden. About $20. 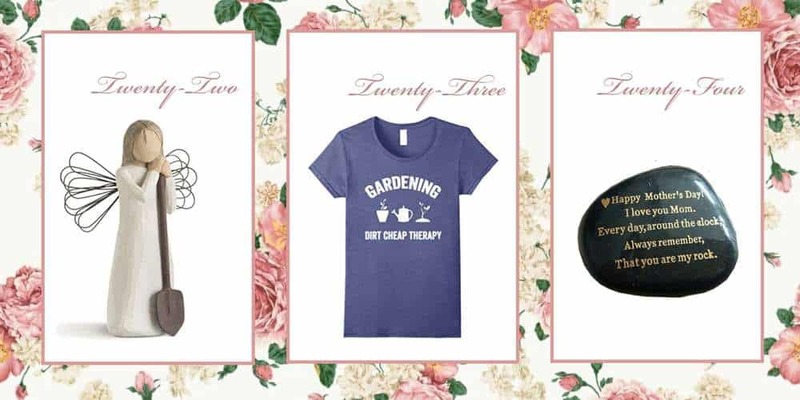 Twenty-Three: For the mother who loves to garden, this is the coolest Gardening T-Shirt. Your choice of multiple colors and sizes, for women, men and kids, too. About $16. Twenty-Four: Your mother may remember the “Pet Rock,” of years gone by. She’ll be grateful this is not that. But yes, this is a rock—a beautiful Engraved Rock with an even more beautiful sentiment. Hand carved and lettered in gold, this is sure to become a sentimental treasure. Every day she will be reminded that she is your rock. About $25. *Update: As of Jan. 2019, Eufy Cordless Stick Vac has been discontinued. But not to worry! Deik Cordless Stick Vac is all that Eufy was, with a few upgraded features. It is interchangeable with Deik and nearly identical to the now-retired Eufy. I love my new Deik and think you will, too. Check it out.